In addition to the custom design services which we offer we manufacture the following products for resale. These products are samples of some of the products we have designed and we are willing to entertain custom modifications to any of the products. Click on the product title for more information. Radio Controlled Marine Railway Winch Motor Controller. This product is intended for boaters who have their boat stored on a dolly which rides on rails and transports the boat to and from the water. It controls the electric motor which positions the dolly. This device could also be used to control electrically reversable motors for other functions if required. General Purpose Timer With Relay Outputs. This product is microprocessor based and can have up to seven inputs with up to four independently adjustable timers and three relay outputs. The function of the product is controlled by the CPU firmware. This product was designed for, and is used by the door control industry but may other uses are possible. Custom versions of this product are available directly from D.G.A.. This product is used in TV signal distribution systems in Hospitals and other Institutions. Its function is to combine Power and RF Television signals together. Eight combined PWR/RF outputs are provide from the one Power and eight RF inputs . 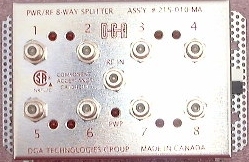 This combined PWR/RF signal is then connected via coaxial cable to special low voltage TVs such as the K10 and L10 series of 10" TVs which were sold by Sumitomo. This product is used in TV signal distribution systems in Hospitals and other Institutions. Its function is to combine Power and RF Television signals together. Eight combined PWR/RF outputs are provide on each splitter from the single RF and PWR inputs . 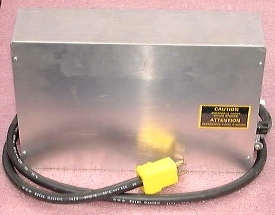 This combined PWR/RF signal is then connected via coaxial cable to special low voltage TVs such as the K10 and L10 series of 10" TVs which were sold by Sumitomo. © 2000, 2006, 2012 D.G.A. Electronics Ltd.